The John Brown University Golden Eagles Women’s Soccer Elite Residential Camp is inviting all female soccer players 15 to 18 years of age. Incoming college freshmen are also eligible to join. It is a three-day residential and commuter camp that will run from the 13th of July until the 15th of July. It is going to take place at the beautiful John Brown University campus. Furthermore, this soccer elite residential camp aims at elevating the participant’s skills in both the offensive and defensive facets of the game. It is also a venue to display exceptional soccer skills. Special sessions are also in place for goalkeepers. In addition, the registration fee is $295 for residential campers and $245 for commuter campers. Lodging for residential campers is in the top-notch Hutcheson Hall. John Brown University is private, coeducational, Christian, liberal arts university in Siloam Springs, Arkansas. Its name is in honor of John E. Brown, a well-known Methodist evangelist. Overall, John Brown University has an accreditation from the North Central Association. It is a proud member of the Council for Christian Colleges and Universities (CCCU). Presently, the university is serving around 2,000 undergraduate students. 42 percent of this undergraduate student population are male students and 58 percent are female students. This student population is also through a more selective 77 percent enrollment acceptance rate. Correspondingly, John Brown University’s student to faculty ratio is 13:1. The university is also serving around 500 postgraduate students. John Brown University is a top-performing academic institution. As a matter of fact, it is 390th in the Forbes Magazine’s List of America’s Best Colleges. It is also 17th in Regional Universities South, 2018 edition of the US News and World Reports Best Colleges rankings. 11th in the Best Colleges for Veterans rankings and 18th in the Best Value schools rankings. In athletics, the university is participating in the Sooner Athletic Conference of the National Association of Intercollegiate Athletics. They are the Golden Eagles and royal blue and gold are their identity colors. Kathleen Paulsen, a native of Littleton, Colorado, is the head coach of the John Brown University Golden Eagles women’s soccer team. She is now entering her fifth season at the helm of the Golden Eagles women’s soccer program. Coach Kathleen Paulsen is a bachelor’s degree in biology and a master degree in kinesiology graduate from the University of Arkansas. She is also a United States Soccer Federation (USSF) National “D” Coaching License holder. Ultimately, Coach Paulsen led the Golden Eagles to their third NAIA National Championships appearance in 2013. In 2016, she led the Golden Eagles to their second title. Coach Kathleen Paulsen is also a former college soccer standout player herself. In fact, she was a four-year letterwinner during her playing years with the Lady Razorbacks. Then, the John Brown University Golden Eagles women’s soccer graduate assistant coach is Adrienne Kennedy. 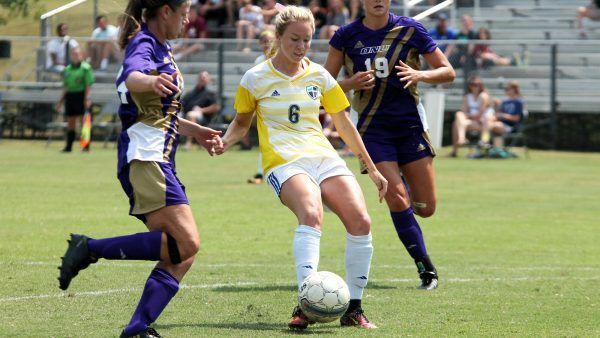 Coach Adrienne Kennedy is the newest addition to the Golden Eagles women’s soccer program. She is a John Brown University graduate with a bachelor’s degree in family and human services. Coach Kennedy is currently completing her master’s degree in marriage and family therapy. Train like a champ at the John Brown University Golden Eagles Women's Soccer Elite Residential Camp. It is both a residential and commuter camp that will run from July 13 to July 15. Its venue is the scenic John Brown University campus which is in Siloam Springs, Arkansas. The training program is open to all girls 15 to 18 years of age.